The blob-shaped galaxy, called GN-108036, is about 12.9 billion light-years away and appears as it existed just 750 million years after the universe began. The universe, for comparison, is about 13.7 billion years old. But the sheer distance to the galaxy isn't the only thing to intrigue scientists. The galaxy is also creating stars at a furious pace, making it a rare cosmic find. NASA officials described the galaxy as shining from the "dawn of time," with star formation inside it occurring at a "shockingly high rate." A photo of the rare galaxy released by NASA shows the object as a red blob surrounded by other bright galaxies. 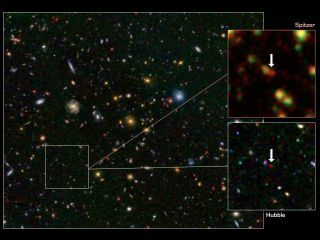 "The discovery is surprising because previous surveys had not found galaxies this bright so early in the history of the universe," said Mark Dickinson of the National Optical Astronomy Observatory in Tucson, Ariz., in a statement announcing the find on Wednesday (Dec. 21). "Perhaps those surveys were just too small to find galaxies like GN-108036. It may be a special, rare object that we just happened to catch during an extreme burst of star formation." An international team of astronomers discovered galaxy GN-108036. It was initially spotted by Japan's Subaru telescope atop the volcano Mauna Kea in Hawaii, and its ultra-far distance was confirmed using the Keck Observatory, also on Mauna Kea. NASA's Hubble Space Telescope and infrared Spitzer Space Telescope were then used to take better images of the galaxy. The research is detailed in the Astrophysics Journal. "We checked our results on three different occasions over two years, and each time confirmed the previous measurement," said study leader Yoshiaki Ono of the University of Tokyo. "We had never seen such a vigorously star-forming galaxy at a comparable distance until the discovery of GN-108036," Ono said. Astronomers measure the distance to objects in space by measuring how much their light is stretched toward the red end of the light spectrum, a factor known as "redshift." The greater an object's redshift, the older and farther away it is, NASA officials explained. GN-108036 has a staggering redshift of 7.2, one of the few objects known with a redshift larger than 7. Just two other objects have been confirmed to be older and more distant than GN-108036, NASA officials said. The newfound galaxy is so ancient that it and others like it may have played a role in the transition from the so-called "dark ages" of the universe — a period before the first stars formed when a thick hydrogen fog permeated the cosmos — into the universe we see today. "This was therefore a likely ancestor of massive and evolved galaxies seen today," said Bahram Mobasher, a team member from the University of California, Riverside.